The other night I had some Indian-inspired chicken I wanted to grill and had no idea what to serve with it. It had a been a long day, it was late and I wanted something quick and easy. It doesn’t look like much once it’s all together, but it was really good and I’ll definitely be making it again. It’s a bit savory and sweet from the honey. A perfect side for both Indian and Greek dishes. I think it would be good with lamb burgers, lamp chops, plain grilled chicken, tangine shrimp (this is a great cookbook I own), etc. Honestly? It’s so light and refreshing that I’d also serve it with just burgers and dogs. 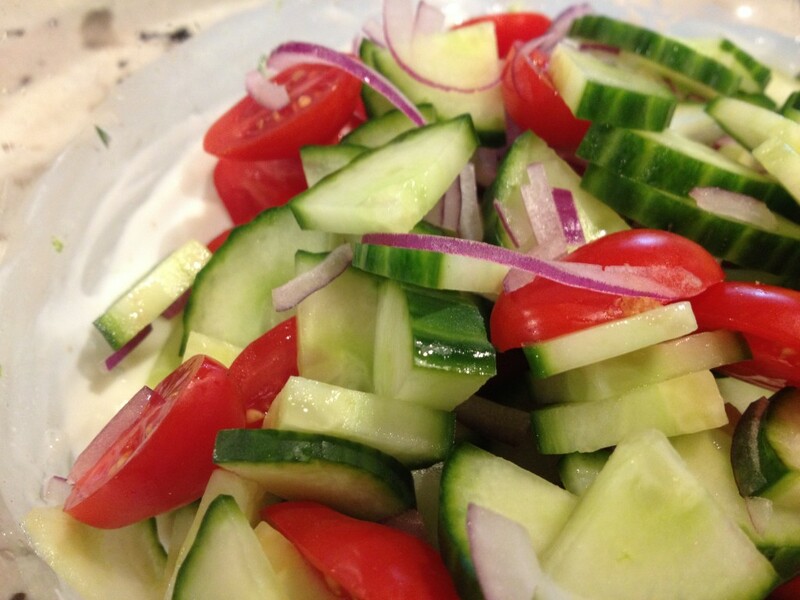 It’s a great summer salad. 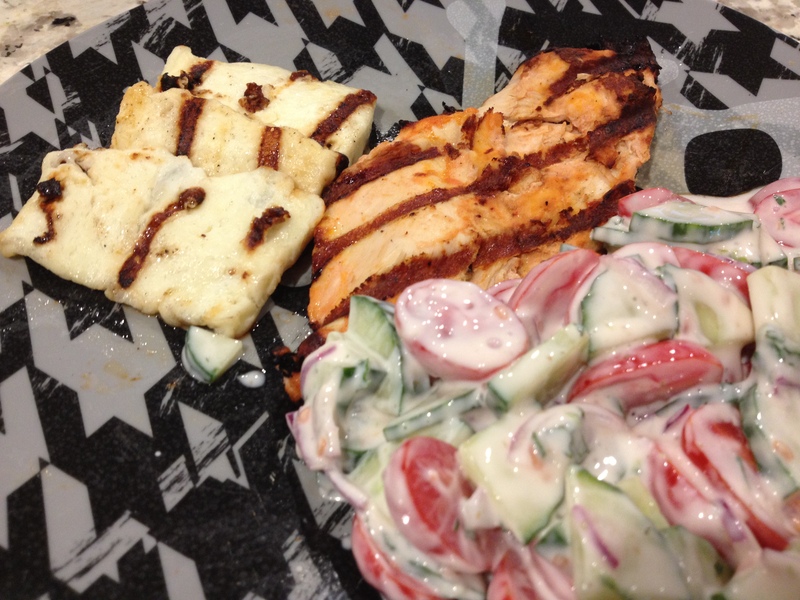 It’s a HORRIBLE presentation, but this was the final results of dinner… I served the salad with some Tiki Masala marinated and grilled chicken (that I bought frozen from Whole Foods) and grilled halloumi (one of my latest obsessions). I just adore halloumi… it’s one of the only cheeses out there that holds up to grilling and is specifically made to grill. We had it for the first time on our honeymoon in Greece 10 years ago, where it is very popular. 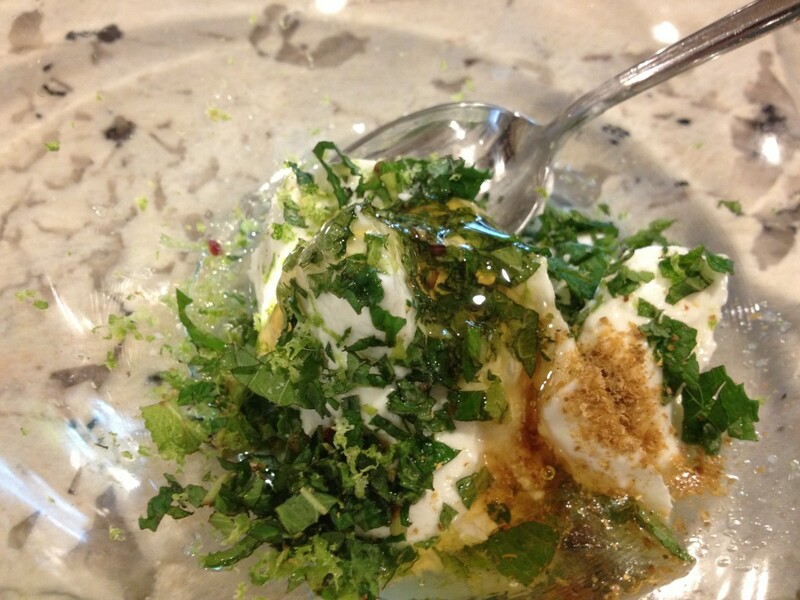 It’s sort of like saltier mozzarella cheese, that borders on a bit rubbery once grilled… and it tastes fantastic. 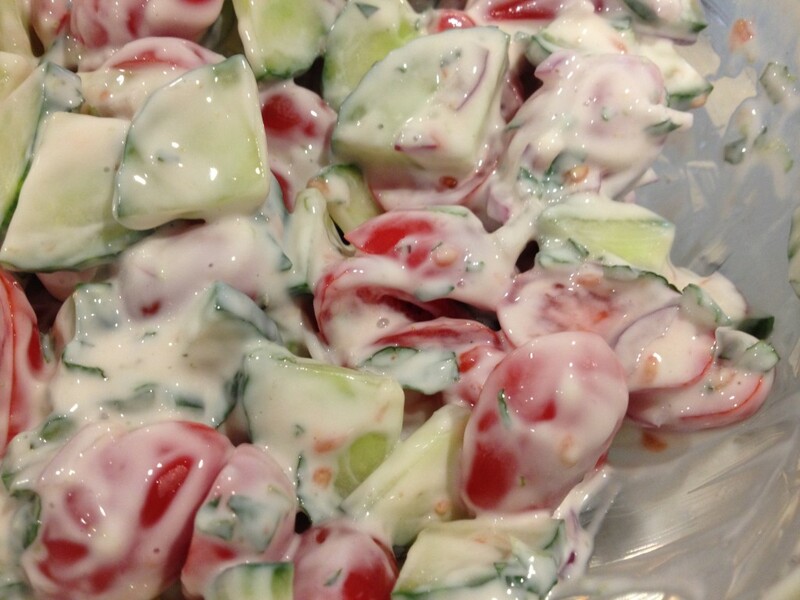 A definite must-try during your summer grilling! To grill halloumi, I don’t do any prep work. You just simply slice it about a 1/4″ thick (you can buy it pre-sliced at Trader Joe’s), and put it directly on the grill rack over medium heat for about 2 minuter per side. Keep an eye on it though — while it doesn’t completely melt, it can get soft enough to fall through the grill rack if you leave it for longer than 2 minutes or if it’s sliced too thin.